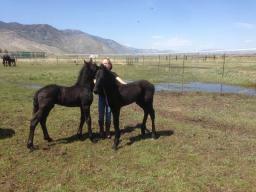 The youth non-profit organization,Between Horses and Humans runs out of Maddi's Friesian Ranch. Once a year we also support them in their fund raiser. 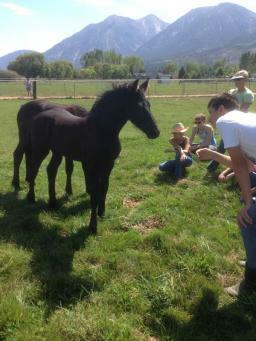 Between Horses and Humans works with youth who able-bodied children and young adults starting at 8 years old who are experiencing circumstances and situations beyond their control; personal crisis, social, emotional and behavior issues. Participants are selected by the program directors of a variety of sources such as social service organizations (Ex. CASA, Dept. of Child and Family Services) public and private schools, educators, counselors, therapists and private individuals. The highly sensitive horses, through their instinctual actions and responses, mirror back to the children the state of their emotions. 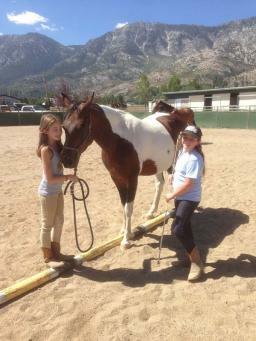 The children learn how to modify their behavior and responses in order to successfully work with the horses. With kindness, patience and intuitive coaching, children learn techniques and leadership skills that go beyond the joyful mastery it gives them, teaching them how to deal with their life challenges in new, positive and life affirming ways. 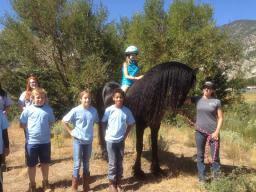 Parents and children alike are thrilled by the changes in character that the horses inspire. One child, debilitated by her home situation, shut down and stopped communicating. After a few sessions with the horses, she exchanged shrugging and nodding for joyous, full conversations with horses and humans. Another child, full of anger and mistrust, found a safe haven and discovered the power of trust. Gradually, the anger diminished, relationships improved and academics soared. Children are finding their voices, discovering their innate confidence, and quieting their souls. Some have climbed out of the pits of despair, while others found successful ways to leave poor choices and become accomplished in school, their relationships and their activities. The magic and love of horses help children move into a state of calmness and ease from which they can deal with life; giving them a chance to go on towards a better future filled with joy and hope.